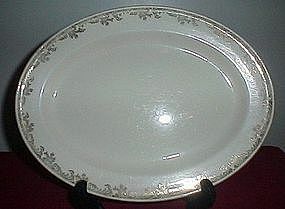 Edwin M Knowles 11 1/2" platter, pattern #43 per Replacements LTD. Gold floral filigree on rim. One small spot of discoloration on bottom, light wear. This pattern discontinued in 1937.